For the first time in its history, Tweetsie brings Christmas Cheer! For the month of December you can spend a Friday or Saturday night enjoying the festive and yule time atmosphere of Tweetsie Christmas. There are many activities for parents and children of all ages to enjoy! Stephen McDaniel, one of our top producing agents here at Vincent Properties and father of 3 boys recently visited the newest High Country attraction. 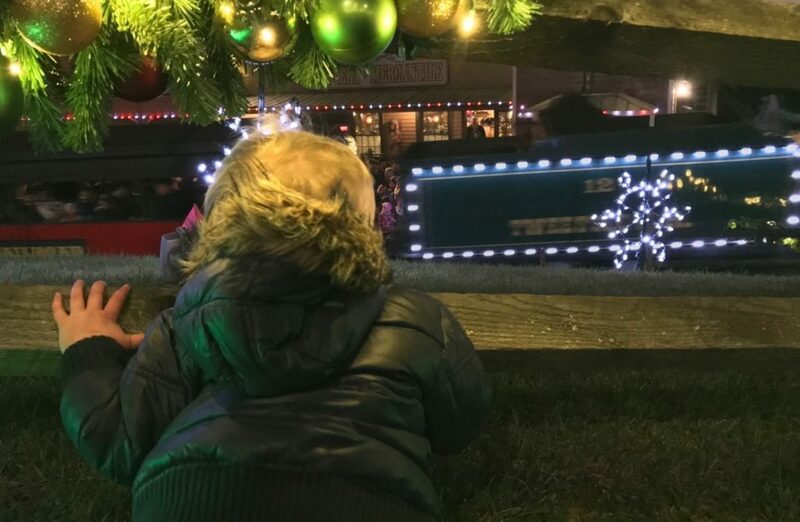 “My sons absolutely LOVES Tweetsie Railroad during the summer months, and now that they offer Tweetsie Christmas- my wife and I decided we definitely had to check it out” Stephen stated. Meet Santa! In his own home, made of gingerbread filled with candied furnishings. Imagine sitting on a chocolate truffle or resting on a piece of ribbon candy just before you meet Santa! You can also have your picture taken with him on his Gingerbread bench. Tweetsie Train, of course! Remember to dress warm, the cars have open windows! Take a ride through the Blue Ridge Mountains on a crisp winter’s night, as you enjoy Christmas carols and the tracks dazzlingly lit for the holidays. Christmas Lights Lots of them — thousands to be exact! Holiday lighting professionals have created a winter wonderland of lights not only along the three-mile track but also throughout the open areas of the park. Look for the tunnel of lights and the 40’ LED interactive Christmas tree. Enjoy the sounds of Christmas! A 15-minute variety show in the Tweetsie Palace. You can enjoy the show and warm up with a bowl of chili or soup! Step into a Life Sized Snow Globe Filled with swirling (synthetic) snow, peak through a Christmas present, feel dwarfed by nut crackers, toy soldiers, candy canes, toy drums, and more. “Roasting S’mores Over an Open Fire (pit)” Who said summer was the only time to enjoy s’mores? You can also enjoy freshly baked cookies, warm funnel cakes, and other handmade items from Tweetsie Railroad’s famous Fudge Shop.